DON’T LOOK BACK…..LOOK TO THE FUTURE….. Although most of the thirty-three degrees of the Scottish Rite existed in parts of previous degree systems, the Scottish Rite did not come into being until the formation of the Mother Supreme Council at Charleston, South Carolina, in May 1801. The Founding Fathers of the Scottish Rite who attended became known as “The Eleven Gentlemen of Charleston”. On October 28, 1736 Soloman’s Lodge No. 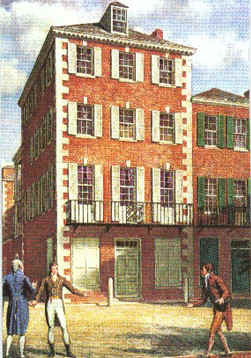 1 is established in Charles Town, South Carolina at Mr. Charles Shepheard’s Tavern and present was Mr. Thos Harbin, Junior Warden. It seems Scottish Rite, 32nd Degree, was established in Charles Town, South Carolina by Da Costa in February, 1783 where the “Sublime Grand Lodge Of Perfection” first met. The Harbins then owned the Wharf at Barbados, the ship The Three Brothers and Harbin Plantation. Later John Harbin was present when The Masons at Looney’s Tavern set up The Free State Of Winston during the Civil War to try to remain neutral. You can imagine how that turned out. Harbin Plantation was later owned by a Francis Marion, The Swamp Fox, nephew.